– WWE’s website has posted a storyline update on Triple H following the attack from Kevin Nash on last night’s RAW Supershow. They report that the WWE COO has suffered fractured vertebrae in his neck. The doctor adds that Triple H will be out of action for at least six weeks. – In addition to The Rock and John Cena vs. The Miz and R-Truth, CM Punk vs. WWE Champion Alberto Del Rio – Kevin Nash vs. Triple H in some sort of gimmick match is planned for WWE’s Survivor Series pay-per-view. – As noted earlier today, WWE changed plans with The Rock and John Cena at Survivor Series as they originally had a traditional Survivor Series match planned with the two on the same team. That was changed to The Rock and John Cena vs. The Miz and R-Truth in part because officials felt that putting Rock and Cena in a traditional 5-on-5 match would take too much attention off them going into their WrestleMania 28 match. – Monday night’s RAW concluded with Interim Raw General Manager John Laurinaitis ordering The Miz and R-Truth to exit the ring after the two continued to batter Cena following their match. The executive then made a huge announcement — John Cena will take on The Miz and R-Truth at Survivor Series with a partner of his choosing. Cena extended an invitation to his opponent at WrestleMania XXVIII, The Rock. WWE aired an advertisement for Monday’s RAW during tonight’s NXT taping in Houston, Texas asking whether The Rock will accept Cena’s offer to join forces at the Survivor Series. * Drew McIntyre beat Johnny Curtis in a squash. * Teddy Long opens the show and talks about the fate of the World Heavyweight Title. Christian comes out and as usual wants a title shot. CM Punk interrupts him and apparently Teddy has brought some RAW stars to tonight’s show. Punk vs. Christian is announced for tonight. * The Miz and R-Truth beat Evan Bourne and Kofi Kingston in a quick non-title match when Truth pinned Kofi. Truth and Miz cut a promo after the match and teased that The Rock may take out John Cena before they can. * Backstage segment with Daniel Bryan, Tyson Kidd and Santino Marella. Santino proposes Bryan vs. Kidd to see who’s best later tonight. * Wade Barrett beat Trent Baretta in another quick match. * Randy Orton beat Dolph Ziggler in another non-title match. This will probably end up being match of the night. Orton won with the RKO. After the match, Orton had a staredown with Cody Rhodes, who did commentary for the match. * Backstage interview with Matt Striker and the fake Sin Cara. He has a new look and is out to get the original Sin Cara. * Daniel Bryan defeated Tyson Kidd in less than five minutes with the LaBell Lock. I’m pretty sure Bryan came out to a new theme song as well. * Michael Cole got our attention and ripped on Jim Ross some more, showing the fake photos from RAW again. Cole says JR has accepted his challenge and The Michael Cole Challenge is on for Monday. * Big Show comes out to talk about Vengeance and the match against Mark Henry. Show says he has a rematch coming and out comes Henry. Henry said he’s moving on from Show but they had a staredown to end the segment. * CM Punk defeated Christian in the main event that saw interference from Ricardo Rodriguez, Alberto Del Rio and Sheamus. Sheamus distracted Christian, allowing Punk to hit the GTS for the win. – Kevin Nash expects to be medically cleared by doctors on Friday to wrestle. He has not wrestled since returning at SummerSlam due to a medical issue with his WWE mandated physical, which occurred after the storyline had commenced. Meanwhile, Nash is expected to appear on tonight’s RAW SuperShow after returning to WWE programming last night at Vengeance. He was spotted leaving a hotel in nearby Austin, Texas this afternoon. The Undertaker and Michelle McCool backstage at RAW! – The Undertaker and Michelle McCool were spotted this afternoon by fans situated in the parking at the Frank Erwin Center in Austin, Texas (site of tonight’s RAW) entering the venue. The married couple reside in Austin and are likely just backstage visiting friends. It is also where they tied the knot in June 2010. John Cena's new ring gear, The Rock on RAW next week? – As seen at WWE’s Vengeance pay-per-view last night, John Cena debuted his new “Rise Above Hate” shirt and did away with the “jorts” jean shorts he always wears. WWE’s shop website has the t-shirts up for sale in adult, women and youth sizes plus sweatbands, a pendant and a baseball cap to fit Cena’s new theme. Cena wrestled in a pair of camouflage shorts last night. Cena told fans on Twitter a few months back that he was considering changing his look up a bit. However, it’s said that last night’s change, besides the Rise Above Hate shirt, wasn’t permanent and Cena was just wearing the camo shorts to pay tribute to the troops at nearby Fort Hood. – There has been talk of having The Rock show up at next week’s RAW Supershow on Halloween. That show will be hosted by The Muppets. – Wade Barrett defeated Daniel Bryan again with the Wasteland in the WWE Vengeance dark match. – Just because so many people have asked, yes, the ring was gimmicked for The Big Show vs. Mark Henry match. WWE’s ring crew rigged it during the middle of the match. More on this tomorrow (Monday). – William Regal defeated Ace Steele at a WLW show in Eldon, MO last night for the annual Harley Race training camp. Hall of Famer Ricky Steamboat was also there watching all of the matches and giving feedback. WWE Vengeance stream is now LIVE! The WWE Vengeance stream will be posted here LIVE for free at 8 pm EST. – John Cena has been topped as WWE’s top merchandise seller by CM Punk. For the first time in five years, a regular wrestler has topped John Cena. The Rock had previously accomplished this during his short return, but in addition to topping Cena, Punk has also topped the single day sales record of the Rock. This is the first time in 5-years anyone has topped Cena from within the company and not only has Punk done so at WWE Shopzone, but also at live events Punk is the merchandise king. – As we noted last week here on the website, WWE has plans to run another live episode of WWE SmackDown!. The show will air live from Charlotte, North Carolina on Tuesday, November 29th. Just like last time they did a live episode, they’ll be airing the replay several days later at the normal timeslot on Friday night. This is basically another ratings test to see if a permanent move to Tuesday nights will take place. *Smackdown opens with a backstage segment featuring Teddy Long and Zack Ryder discussing the Raw walk-out. Long says Raw’s loss will be Smackdown’s gain. 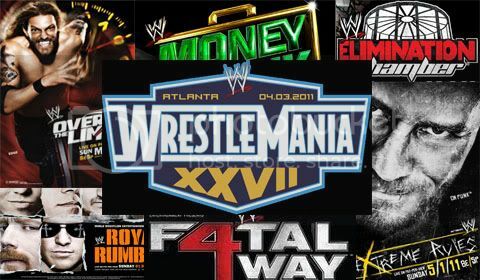 *In the ring are Christian, Wade Barrett, David Otunga, Dolph Ziggler, Jack Swagger, Cody Rhodes and Vickie Guerrero. They say that unless HHH steps down as COO, they will be boycotting live events as its not a safe working environment. *WWE champ Alberto Del Rio comes out and says that the Smackdown stars won’t return to Raw as long as HHH is COO. He’s here to show Smackdown what Raw will be missing this Monday. Teddy Long comes out and announces Sheamus & Randy Orton vs. Cody Rhodes & Christian as tonight’s main event, but says that since Del Rio wants to be in action tonight, he will face Sin Cara. *WWE champion Alberto Del Rio defeated Sin Cara. After the match, Black Cara attacked Blue Cara. *Backstage, Matt Striker interviewed WWE Tag Team champions Air Boom, asking them why they walked out on Raw. They said it was a culmination of many things but until HHH steps down, the fans won’t see Air Boom anywhere but Smackdown. *Jack Swagger and WWE United States champion Dolph Ziggler defeated WWE Tag Team champions Air Boom in a non title match. The champions were attacked as they made their entrance and were on the defensive for most of the match. *WWE Divas champion Beth Phoenix defeated Alicia Fox in 30 seconds. After the match, Fox was trapped in Beth’s submission while Natalya screamed at her on the mic to cry and scream. *Big Show makes his return and cuts a promo about finally returning after being hurt for several months. World champion Mark Henry came out and cut a promo saying he’ll deal with Show in time, but Show hasn’t done a thing to deserve a title shot. *Matt Striker interviewed Randy Orton, asking him why he wasn’t out there for the HHH vote of confidence on Monday. Orton says if he has a problem with HHH, he’ll deal with him personally. He says he doesn’t play well with others and doesn’t like a group mentality. *Big Show returns to the ring and says that he wants Mark Henry tonight and wants Henry’s answer by tonight. It looks like they are adding something to the previous segment or perhaps re-filming it. *Ezekiel Jackson pinned Jinder Mahal. *Backstage, Johnny Ace shows up in Teddy Long’s office and says Teddy can count on him if he needs anything. *There is a segment were Hornswoggle and Booker T do Spinaroonies, but that’s likely going to be a segment for the live house only. *Randy Orton & Sheamus defeated WWE Intercontinental champion Cody Rhodes & Christian after Orton nailed Cody with the RKO. *They teased something with Henry and Show but I have to head out due to an early meeting. If they did anything once they ended the taping, I’ll miss it. Interesting to note that like Dayton a few weeks ago, the entire side of the Arena where the hard cameras was located was tarped off with the entire audience on the one side of the venue. The Rock at next 3-hour RAW?, Rhodes gimmick changes? There has been talk of doing away with Cody Rhodes’ protective mask soon. On a related note, word is that WWE actually made the decision to have Cody bring back the classic white Intercontinental Title belt some time in the past week or two. Officials were hoping that his promo at Hell in a Cell would get him over as a credible champion. The Rock is being advertised to appear at the next three-hour RAW from Boston, MA on 11/14. We shall see. CM Punk to get a major push, The Marine 3? – WWE Studios is looking for a screenwriter to put together a script for The Marine 3. The plan is for another WWE star to play the lead in the film, similar to John Cena​ (The Marine 1) and Ted DiBiase (The Marine 2​). – The company is also looking for film ideas to place CM Punk into. They plan to do a lot with Punk in the upcoming year, due to the company being impressed with how much merchandise he has moved in the recent months. There are plans to move Punk into prominent roles moving forward. – It was noted that during the final segment on RAW last night, names like John Cena, CM Punk, Randy Orton, Sheamus, Mason Ryan, Eve Torres and Kelly Kelly weren’t at ringside. Word is that WWE was expecting the fans to boo the Superstars who walked out and didn’t want certain ones getting heat from the crowd. – Alberto Del Rio vs. CM Punk​ vs. John Cena is the advertised dark match for tonight’s RAW at the Cajundome in Lafayette, LA. The HIAC stream is now available on PPV stream page on this blog. The replays will be posted tomorrow, thank you and enjoy!